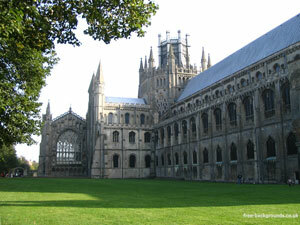 Ely Cathedral has been built over many centuries in several different styles as each stage has been completed. Some parts are no longer standing. Rows of coloured windows on one wall, and a very large clear window on another. The two people in the bottom right of the picture put some scale on the building and its very impressive stained glass windows. The city of Ely is on a natural rise (the Isle of Ely) in the otherwise completely flat fens of East Anglia, UK. Because of this, the cathedral can be seen for many many miles around.